Uganda: Who is Major General Mugisha Muntu? Kampala — Born in October 1958 in Ntungamo District, Maj Gen Gregory Mugisha Muntu is described by those close to him as a principled and unwavering military officer and politician. This description is premised on the decision he made to join the National Resistance Army (NRA) commanded by President Museveni in 1982 to fight the regime of Milton Obote, to the chagrin of his family because his father was a close friend of the late Obote. His parents Enock Ruzima Muntuyera and Aida Matama Muntuyera being confidants of President Obote and being state functionaries, gave Gen Muntu an affluent childhood. "President Obote knew General Muntu very well. He used to ask what Gregory wanted and would wonder why he became a rebel," a retired army officer said. His father, later died when Gen Muntu was in the bush fighting and he never returned to burry him. During the early days of the NRA bush war in Luweero, Gen Muntu was injured and quietly brought to the former Kisekka Military Hospital located near Kisekka Market, in Kampala for treatment. He was treated by the rebel collaborators who were working in the hospital and he later sneaked back to the bush after recovery. Gen Muntu was in the same group of Maj John Kazoora, Maj Gen Benon Biraaro, Lt Gen Henry Tumukunde, Dr Kizza Besigye, Gen David Sejusa whose joining of the military was driven by political ideals and have continued to be key players in Uganda's political history. "These officers were politicians right from the start of the NRA war. They are not career soldiers," says a UPDF Colonel who does not want to be named. During and after the bush war, Gen Muntu was an intelligence officer until 1989 when he was appointed Army Commander of the NRA, now UPDF. In military intelligence he had under his command personalities who included Rwandan President Paul Kagame, who was deputy Director of Intelligence. Gen Muntu underwent further military training in Russia before becoming the Commander of the 4th Division in Gulu. President Museveni promoted him from the rank of Colonel to Maj General, jumping the rank of Brigadier and appointed Army Commander. Sgt Tom Gitta, who retired from the army in 1999 after serving for 17 years, says Gen Muntu was a strict disciplinarian and that earned him enemies within the UPDF. "He is the one who introduced Kateebe [being suspended from work] in the army. The undisciplined soldiers would be suspended from work and it made him unpopular in the army," he says. After one year of his appointment as the Commander of the NRA, Rwandan soldiers in the force defected and attacked Rwanda in 1990. This left many ghost soldiers on the army nominal roll which in the end prolonged the wars in northern and eastern Uganda. He was dropped as the Army Commander in 1997 and was replaced by Gen Jeje Odongo. On the day of his sacking, Gen Muntu says he had taken his family to Murchison National Park for a holiday. In an interview with Daily Monitor in 2012, Gen Muntu said it was the first time he had taken a break since 1989 when he was appointed Army Commander. After his sacking, Gen Muntu started making political statements that sent a signal that he was falling out with his former ally, President Museveni. In 2008, he unsuccessfully contested for the FDC's presidency, against Besigye before he was elected as party president in 2012. He lost the party presidency to Patrick Amuriat in 2017. 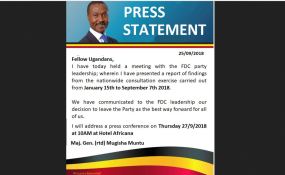 His supporters later accused Dr Besigye of frustrating him and that is when internal voices within FDC started calling for his exit to start a third force.